A funky 'street art' library card for Worcestershire's teenagers aged 13 - 19 years. 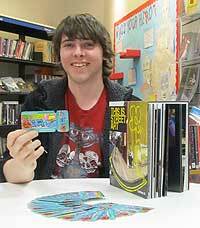 The Young Person's Library Card is believed to be the first dedicated library card for teenagers in the Midlands and was designed by local artist Louis Burrows who comes from Evesham. Louis, aged 19 and from Evesham, entered the countywide competition to design the card, and it was his colourful 'street art' graffiti design that won. Teenagers aged 8 - 16 years can also become instant members, which entitles them to borrow up to two books without having to provide a signature from a parent or guardian. This instant membership can be upgraded to full membership by visiting the library with a parent or guardian with a form of identification showing name and address.